Since 14 November 1997, the Community has been a Party to the International Convention for the Conservation of Atlantic Tunas (2) (hereinafter referred to as the Convention). At its 16th Special Meeting in November 2008, the International Commission for the Conservation of Atlantic Tunas (ICCAT) adopted Recommendation 08-05 to establish a new recovery plan for bluefin tuna in the eastern Atlantic and Mediterranean ending in 2022 and replacing the recovery plan adopted in 2006. In order to rebuild the stock, the new ICCAT recovery plan provides for a graduated reduction in the total allowable catch level from 2007 to 2011, restrictions on fishing within certain areas and time periods, a new minimum size for bluefin tuna, measures concerning sport and recreational fishing activities, farming and fishing capacity measures as well as reinforced control measures and the implementation of the ICCAT scheme of joint international inspection to ensure the effectiveness of the recovery plan. It is therefore necessary to implement the new ICCAT recovery plan by means of a Regulation establishing a recovery plan as provided for in Article 5 of Council Regulation (EC) No 2371/2002 of 20 December 2002 on the conservation and sustainable exploitation of fisheries resources under the common fisheries policy (3), which should enter into force before the beginning of the main fishing season. The ICCAT recovery plan of 2006 was incorporated in Community law by Council Regulation (EC) No 1559/2007 of 17 December 2007 establishing a multi-annual recovery plan for bluefin tuna in the Eastern Atlantic and Mediterranean (4). The adoption by ICCAT of a new recovery plan for bluefin tuna requires the amendment of Council Regulation (EC) No 43/2009 of 16 January 2009 fixing for 2009 the fishing opportunities and associated conditions for certain fish stocks and groups of fish stocks, applicable in Community waters and, for Community vessels, in waters where catch limitations are required (5), repeal of Regulation (EC) No 1559/2007 and its replacement by this Regulation. This Regulation lays down the general rules for the application by the Community of a multiannual recovery plan for bluefin tuna (Thunnus thynnus) recommended by the International Commission for the Conservation of the Atlantic Tunas (ICCAT). This Regulation shall apply to bluefin tuna in the eastern Atlantic and the Mediterranean. The objective of that recovery plan shall be to achieve a biomass corresponding to the maximum sustainable yield with greater than 50 % probability. ‘Task II’ means Task II as defined by ICCAT in the ‘Field manual for statistics and sampling Atlantic tunas and tuna-like fish’ (Third edition, ICCAT, 1990). All lengths of vessels referred to in this Regulation shall be understood as length overall. 1. Each Member State shall take the necessary measures to ensure that the fishing effort of its catching vessels and its traps are commensurate with the fishing opportunities on bluefin tuna available to that Member State in the eastern Atlantic and Mediterranean. 2. Each Member State shall draw up an annual fishing plan for the catching vessels and traps fishing bluefin tuna in the eastern Atlantic and Mediterranean. for the catching vessels less than 24 m and for traps, at least the quota allocated to producer organisations or groups of vessels fishing with similar gear. 4. No later than 31 January each year, the annual fishing plan shall be transmitted to the European Commission (hereinafter referred to the Commission). The Commission shall transmit the fishing plans to the ICCAT Secretariat by 1 March each year. 5. Any subsequent modification to the annual fishing plan or to the specific method to manage the quota allocated shall be transmitted to the Commission at least 13 days before the exercise of the activity corresponding to that modification. The Commission shall transmit such modification to the ICCAT Secretariat at least 10 days before the exercise of the activity corresponding to that modification. committed an infringement referred to in Article 33. The flag Member State shall ensure that a physical inspection takes place under its authority in its ports or by another person designated by the flag Member State when the vessel is not in one of its ports. The flag Member State shall withdraw the fishing authorisation for bluefin tuna and may require the vessel to proceed immediately to a port designated by it when the individual quota is deemed to be exhausted. the total number of days each catching vessel fished in the eastern Atlantic and Mediterranean. The Commission shall transmit the reports to the ICCAT Secretariat by 15 October each year. Given that the fishing seasons close for certain gears on 15 October, Member States may submit additional information on these fisheries at a later stage to the Commission. 8. Private trade arrangements between nationals of a Member State and a CPC in order to use a fishing vessel flying the flag of that Member State for fishing in the framework of a tuna quota of a CPC shall not be conducted without an authorisation by the Member State concerned, which shall inform the Commission, and by the ICCAT Commission. 9. By 1 March each year, Member States shall send to the Commission the information on any private trade arrangements between its nationals and a CPC. the name of the CPC concerned. 11. The Commission shall send without delay the information referred to in paragraph 9 to the ICCAT Secretariat. 12. The Commission shall ensure that the percentage of other CPCs’ quotas for bluefin tuna that may be used for chartering of Community fishing vessels in accordance with Article 8b of Council Regulation (EC) No 1936/2001 (7) shall not exceed 20 % of these CPCs’ quotas in 2009. 13. Chartering of Community fishing vessels for bluefin tuna in the eastern Atlantic and Mediterranean shall be prohibited as from 2010. 14. Each Member State shall ensure that the number of its bluefin tuna fishing vessels chartered and the duration of the charter shall be commensurate with the quota allocated to the charter nation. 15. Each Member State shall allocate a specific quota for the purpose of recreational and sport fisheries and shall inform the Commission before the start of the fishing season referred to in Article 7(5). 1. Each Member State shall ensure that its fishing capacity is commensurate with its quota. 2. The number, and the total corresponding gross tonnage, of fishing vessels flying the flag of a Member State that may fish for, retain on board, tranship, transport, or land bluefin tuna shall be limited to the number, and the total corresponding gross tonnage, of fishing vessels flying the flag of that Member State that fished for, retained on board, transhipped, transported, or landed bluefin tuna during the period from 1 January 2007 to 1 July 2008. This limit shall apply by gear type for catching vessels and by vessel type for other fishing vessels. 3. For the purpose of paragraph 2, the Council, acting in accordance with the procedure laid down in Article 20 of Regulation (EC) No 2371/2002, shall determine the number and the total corresponding gross tonnage of the fishing vessels of each Member State that fished for, retained on board, transhipped, transported, or landed bluefin tuna during the period from 1 January 2007 to 1 July 2008. This limit shall be applied by gear type for catching vessels and by vessel type for other fishing vessels. 4. The number of traps of a Member State engaged in the eastern Atlantic and Mediterranean bluefin tuna fishery shall be limited to the number of traps authorised by that Member State before 1 July 2008. 5. For the purpose of paragraph 4, the Council, acting in accordance with the procedure laid down in Article 20 of Regulation (EC) No 2371/2002, shall determine the number of traps authorised by each Member State before 1 July 2008. 6. The freezing of fishing capacity referred to in paragraphs 2 and 4 may not apply to a Member State which demonstrates that it needs to develop its fishing capacity so as to fully use its quota. 7. Without prejudice to paragraph 6, the fishing capacity referred to in paragraphs 2 and 4 and Article 9 shall be reduced, so as to eliminate by 2010 for each Member State at least 25 % of the discrepancy between its fishing capacity and its fishing capacity commensurate with its quota in 2010. To calculate the fishing capacity reduction, the estimated yearly catch rates per vessel and gear shall be taken into account. This reduction requirement may not apply to a Member State which demonstrates that its fishing capacity is commensurate with its quota. 8. For the purpose of paragraph 7, the Council, acting in accordance with the procedure laid down in Article 20 of Regulation (EC) No 2371/2002, shall determine the number and total capacity in gross tonnage of fishing vessels of each Member State that may be authorised to fish for, retain on board, tranship, transport, or land bluefin tuna. 9. Each Member State shall establish a management plan of fishing capacity over 2010-2013. That plan shall be submitted to the Commission by 15 August 2009, and shall include the information referred to in paragraphs 2, 4, 6 and 7. The Commission shall submit the Community management plan of fishing capacity over 2010-2013 to ICCAT by 15 September 2009. 1. The tuna farming and fattening capacity of a Member State shall be limited to the tuna farming and fattening capacity of the farms of that Member State that were registered in the ICCAT record of farming facilities or authorised and declared to ICCAT as of 1 July 2008. 2. The maximum input of wild caught bluefin tuna into the farms of a Member State shall be limited for 2010 to the level of the input quantities registered with ICCAT by the farms of that Member State in 2005, 2006, 2007 or 2008. 3. Within the maximum input quantity of wild caught bluefin tuna referred to in paragraph 2, each Member State shall allocate inputs to its farms. 4. For the purpose of paragraphs 1 and 2, the Council, acting in accordance with the procedure laid down in Article 20 of Regulation (EC) No 2371/2002, shall determine the tuna farming and fattening capacity for each Member State and the maximum input of wild caught bluefin tuna that each Member State may allocate to its farms. 5. Each farming or fattening Member State shall establish a management plan of farming and fattening capacity over 2010-2013. That plan shall be submitted to the Commission by 15 August 2009 and shall include the information referred to in paragraphs 1 to 3. The Commission shall submit the Community management plan of farming and fattening capacity over 2010-2013 to ICCAT by 15 September 2009. 1. Bluefin tuna fishing shall be prohibited in the eastern Atlantic and Mediterranean by large-scale pelagic longline catching vessels over 24 m during the period from 1 June to 31 December with the exception of the area delimited by west of 10° W and north of 42° N, where such fishing shall be prohibited from 1 February to 31 July. 2. Purse seine fishing for bluefin tuna shall be prohibited in the eastern Atlantic and Mediterranean during the period from 15 June to 15 April. 3. Bluefin tuna fishing by baitboats and trolling boats shall be prohibited in the eastern Atlantic and Mediterranean during the period from 15 October to 15 June. 4. Bluefin tuna fishing by pelagic trawlers shall be prohibited in the eastern Atlantic during the period from 15 October to 15 June. 5. Bluefin tuna recreational and sport fishing shall be prohibited in the eastern Atlantic and Mediterranean from 15 October to 15 June. 6. By way of derogation from paragraph 2, if a Member State can demonstrate that, due to winds reaching force 5 or more on the Beaufort scale, certain of its purse seine catching vessels fishing for bluefin tuna in the eastern Atlantic and Mediterranean were unable to utilise their normal fishing days, that Member State may carry over a maximum of 5 days lost until 20 June. the Community fleet register number (CFR) as defined in Annex I to Regulation (EC) No 26/2004. The Commission shall forward without delay this information to ICCAT. The use of aircraft or helicopters for searching for bluefin tuna shall be prohibited. 1. The minimum size for bluefin tuna in the eastern Atlantic and in the Mediterranean shall be 30 kg or 115 cm. bluefin tuna caught in the Mediterranean by the coastal artisanal fishery for fresh fish by baitboats, longliners and handliners. 3. For the purpose of paragraph 2(a), the Council, acting in accordance with the procedure laid down in Article 20 of Regulation (EC) No 2371/2002, shall determine the maximum number of baitboats and trolling boats authorised to fish actively bluefin tuna in the eastern Atlantic. By way of derogation from Article 5(2), the number of baitboats and trolling boats is set at the number of Community catching vessels participating in the directed fishery for bluefin tuna in 2006. 4. For the purpose of paragraph 2(b), the Council, acting in accordance with the procedure laid down in Article 20 of Regulation (EC) No 2371/2002, shall determine the maximum number of catching vessels authorised to fish actively bluefin tuna in the Adriatic Sea for farming purposes. By way of derogation from Article 5(2), the number of catching vessels is set at the number of Community catching vessels participating in the directed fishery for bluefin tuna in 2008. 5. For the purpose of paragraph 2(c), the Council, acting in accordance with the procedure laid down in Article 20 of Regulation (EC) No 2371/2002, shall determine the maximum number of baitboats, longliners and handliners authorised to fish actively bluefin tuna in the Mediterranean. By way of derogation from Article 5(2), the number of catching vessels is set at the number of Community catching vessels participating in the directed fishery for bluefin tuna in 2008. 6. The Commission shall submit the number of catching vessels referred to in paragraphs 3, 4 and 5 to the ICCAT Secretariat by 30 January each year. 7. For the purpose of paragraph 2(a), (b) and (c), the Council, acting in accordance with the procedure laid down in Article 20 of Regulation (EC) No 2371/2002, shall distribute among the Member States the number of catching vessels determined in accordance with paragraphs 3, 4 and 5. 8. For the purpose of paragraph 2(a), no more than 7 % of the Community quota for bluefin tuna between 8 kg or 75 cm and 30 kg or 115 cm shall be allocated among the authorised catching vessels referred to in paragraph 3, with up to a maximum of 100 tonnes of bluefin tuna weighing no less than 6,4 kg or 70 cm caught by baitboats of less than 17 m by way of derogation from paragraph 2. The Council, acting in accordance with the procedure laid down in Article 20 of Regulation (EC) No 2371/2002, shall decide on the allocation of the Community quota among Member States. 9. For the purpose of paragraph 2(b), the Council, acting in accordance with the procedure laid down in Article 20 of Regulation (EC) No 2371/2002, shall decide on the maximum allocation of the Community quota among Member States. 10. For the purpose of paragraph 2(c), no more than 2 % of the Community quota for bluefin tuna between 8 kg or 75 cm and 30 kg or 115 cm shall be allocated among the authorised catching vessels referred to in paragraph 5. The Council, acting in accordance with the procedure laid down in Article 20 of Regulation (EC) No 2371/2002, shall decide on the allocation of the Community quota among Member States. 11. The additional specific conditions for bluefin tuna caught in the eastern Atlantic by baitboats and trolling boats, for bluefin tuna caught in the Adriatic for farming purposes and for bluefin tuna caught in the Mediterranean by the coastal artisanal fishery for fresh fish by baitboats, longliners and handliners are set out in Annex I. 12. Incidental catches of maximum 5 % of bluefin tuna between 10 kg or 80 cm and 30 kg shall be authorised for all catching vessels fishing actively for bluefin tuna. 13. The percentage referred to in paragraph 12 shall be calculated either on the basis of the total incidental catches in number of fish per landing of the total catches of these catching vessels, or on basis of its weight equivalence in percentage. 14. Incidental catches shall be deducted from the quota of the flag Member State. The discard of dead fish from the incidental catch referred to in paragraph 12 shall be prohibited and shall be deducted from the quota of the flag Member State. 15. Incidental catches of bluefin tuna shall be subject to Articles 17, 18, 21 and 23. 1. Each Member State shall establish a sampling programme for the estimation of the numbers-at-size of the bluefin tuna captured. 2. Sampling by size in cages shall be carried out on a sample of 100 specimens per 100 tonnes of live fish or on a sample of 10 % of the total number of fish placed in a cage. The size sample, on basis of length or weight, shall be taken during harvesting at the farm, and on the dead fish during transport in accordance with the method adopted by ICCAT for notifying data in the framework of Task II. 3. Additional methods and samplings shall be developed for fish reared for more than one year. 4. Sampling shall be carried out during a harvest taken at random and shall cover all cages. The data for sampling carried out each year shall be notified to the Commission by 31 May of the following year. 1. Community catching vessels not fishing actively for bluefin tuna are not authorised to retain on board bluefin tuna exceeding 5 % of the total catch on board by weight or/and number of pieces. 2. By-catch shall be deducted from the quota of the flag Member State. The discard of dead fish from the by-catch referred to in paragraph 1 shall be prohibited while the bluefin tuna fishery is open and shall be deducted from the quota of the flag Member State. 3. By-catch of bluefin tuna shall be subject to Articles 17, 18, 21 and 23 and 34. 1. Each Member State shall issue fishing authorisations to vessels for the purpose of recreational fishing. 2. In the framework of recreational fisheries it shall be prohibited to catch, retain on board, tranship and land more than one individual bluefin tuna in each sea trip. 3. The marketing of bluefin tuna caught in recreational fishing shall be prohibited except for charitable purposes. 4. Each Member State shall record catch data from recreational fishing and communicate the data for the preceding year to the Commission by 30 June each year. The Commission shall forward that information to the Standing Committee on Research and Statistics of ICCAT. 5. Each Member State shall take the necessary measures to ensure, to the greatest extent possible, the release of bluefin tuna caught alive, especially juveniles, in the framework of recreational fishing. 1. Each Member State shall regulate sport fisheries, notably by issuing fishing authorisations to vessels for the purpose of sport fishing. 2. The marketing of bluefin tuna caught in sport fishing competitions shall be prohibited except for charitable purposes. 3. Each Member State shall record catch data from sport fisheries and communicate the data for the preceding year to the Commission by 30 June each year. The Commission shall forward that information to the Standing Committee on Research and Statistics of ICCAT. 4. Each Member State shall take the necessary measures to ensure, to the greatest extent possible, the release of the bluefin tuna caught alive, especially juveniles, in the framework of sport fishing. a list of all other fishing vessels (catching vessels excluded) flying its flag authorised to operate for bluefin tuna in the eastern Atlantic and Mediterranean. During a calendar year, a fishing vessel shall be included in only one of the lists referred to in this paragraph. 3. The Commission shall send the information referred to in paragraphs 1 and 2 to the ICCAT Secretariat so that these vessels can be entered in the ICCAT record of catching vessels authorised to fish actively for bluefin tuna or in the ICCAT record of all other fishing vessels (catching vessels excluded) authorised to operate for bluefin tuna. 4. Without prejudice to Article 11, Community fishing vessels not entered in the ICCAT records shall not fish for, retain on board, tranship, transport, transfer, process or land bluefin tuna in the eastern Atlantic and Mediterranean. 5. Article 8a(2), (6), (7) and (8) of Regulation (EC) No 1936/2001 shall apply mutatis mutandis. 1. By 15 February each year, each Member State shall send the Commission electronically a list of its tuna traps authorised, by issue of a special fishing authorisation, to fish for bluefin tuna in the eastern Atlantic and Mediterranean. The list shall include the name of the traps and the register number. 2. The Commission shall send the list to the ICCAT Secretariat so that those tuna traps can be entered on the ICCAT record of tuna traps authorised to fish for bluefin tuna. 3. Community tuna traps that are not entered into the ICCAT record may not fish for, retain, transfer or land bluefin tuna in the eastern Atlantic and Mediterranean. 4. Article 8a(2), (4), (6), (7) and (8) of Regulation (EC) No 1936/2001 shall apply mutatis mutandis. 1. By 15 February each year, each Member State shall notify to the Commission the list of the catching vessels included in the ICCAT record referred to in Article 14 that have fished for bluefin tuna in the eastern Atlantic and Mediterranean in the preceding fishing year. 2. Each Member State shall notify to the Commission of any information concerning vessels not covered in paragraph 1 but known or presumed to have fished for bluefin tuna in the eastern Atlantic and Mediterranean. 3. The Commission shall transmit to the ICCAT Secretariat the information referred to in paragraph 1 by 1 March each year and the information referred to in paragraph 2. For a port to be determined as designated port, the port Member State shall specify permitted landing and transhipping times and places. The port Member State shall ensure full inspection coverage during all landing and transhipping times and at all landing and transhipping places. 2. Member States shall transmit to the Commission, by no later than 15 February each year a list of designated ports. The Commission shall send this information to the ICCAT Secretariat before 1 March each year. 3. It shall be prohibited to land or tranship from fishing vessels any quantity of bluefin tuna fished in the eastern Atlantic and Mediterranean at any place other than ports designated by CPCs and by Member States in accordance with paragraphs 1 and 2. 1. In addition to complying with Articles 6 and 8 of Council Regulation (EEC) No 2847/93 of 12 October 1993 establishing a control system applicable to the common fisheries policy (8), the master of a Community catching vessel referred to in Article 14 of this Regulation shall enter in the logbook, if applicable, the information listed in Annex II. the name of the tug boat and its ICCAT number. 1. Any joint fishing operations for bluefin tuna shall only be authorised with the consent of the flag State(s) concerned. To be authorised, each fishing vessel shall be equipped to fish bluefin tuna and have an individual quota. the information on the fattening or farming farms of destination. 3. Each Member State shall, at least 15 days before the start of the operation, transmit the information referred to in paragraph 2 to the Commission in accordance with the format set out in Annex V. The Commission shall promptly forward that information to the ICCAT Secretariat and to the flag State of other fishing vessels participating in the joint fishing operation at least 10 days before the start of the operation. 1. The master of a purse seine catching vessel or of another catching vessel over 24 m fishing actively for bluefin tuna shall send, by electronic or other means, to the competent authorities of his flag Member State a daily catch report with, as a minimum, information on the ICCAT register number, the vessel name, the beginning and end of the period, the catch amount (including weight and number of pieces), including zero catch returns, the date and the location (latitude and longitude) of the catches, in accordance with the format set out in Annex IV or in an equivalent format. 2. The master of a catching vessel not referred to in paragraph 1 shall send to the competent authorities of his flag Member State a weekly catch report with, as a minimum, information on the ICCAT register number, the vessel name, the beginning and end of the period, the catch amount (including weight and number of pieces), including zero catch returns, the date and the location (latitude and longitude) of the catches, in accordance with the format set out in Annex IV or in an equivalent format. The catch report shall be transmitted at the latest by Monday noon with the catches taken during the preceding week ending Sunday midnight GMT. This report shall include information on the number of days at sea in the eastern Atlantic and Mediterranean since the beginning of the fishing or since the last weekly report. 3. 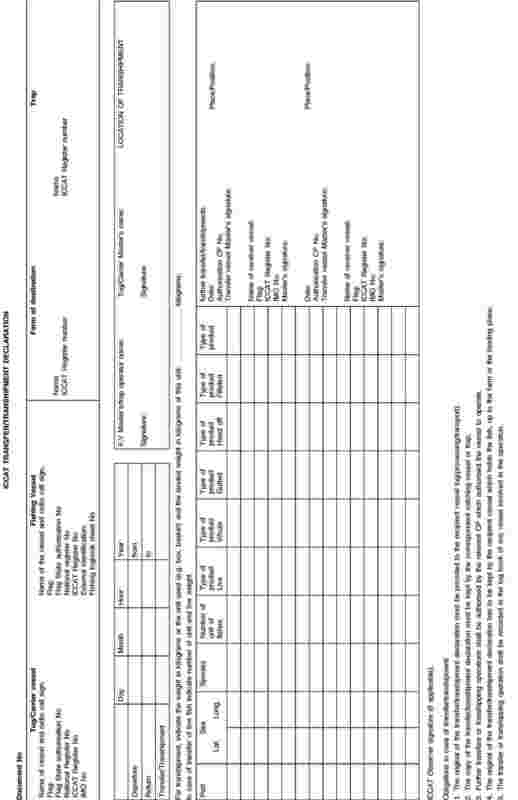 Each Member State shall, upon receipt of the catch reports referred to in paragraphs 1 and 2, promptly forward them in computer-readable form to the Commission and shall ensure to provide promptly to the Commission weekly catch reports in computer-readable form for all catching vessels in accordance with the format set out in Annex IV. The Commission shall forward that information on a weekly basis to the ICCAT Secretariat in accordance with the format set out in Annex IV. 4. Member States shall inform the Commission, before the 15th day of each month, of the quantities of bluefin tuna caught in the eastern Atlantic and Mediterranean which have been landed, transhipped, trapped or caged by the fishing vessels flying their flag during the preceding month. The Commission shall promptly forward that information to the ICCAT Secretariat. 2. Authorities of the port Member State shall keep a record of all prior notices for the current year. 3. The authorities of the port Member State shall send a record of the landing to the authorities of the flag State of the fishing vessel, within 48 hours after the landing has ended. 4. After each trip and within 48 hours of landing, the masters of Community catching vessels shall submit a landing declaration to the competent authorities of the Member State or of the CPC where the landing takes place and to its flag Member State. The master of the authorised catching vessel shall be responsible for the accuracy of the declaration, which shall indicate, as a minimum, the quantities of bluefin tuna landed and the area where they were caught. All landed catches shall be weighed and not estimated. the name of the receiving tug vessel, number of cages towed and ICCAT number record. the tug vessel declared to receive the transfer of fish is not registered in the ICCAT record of all other fishing vessels referred to in Article 14 or is not equipped with a Vessel Monitoring System (VMS). 3. The master of a catching vessel shall complete and transmit to the competent authorities of his flag Member State, at the end of the transfer operation to the tug vessel, the ICCAT transfer declaration, in accordance with the format set out in Annex III. 4. The transfer declaration shall accompany the transfer of fish during transport to the farm or a designated port. 5. The authorisation for transfer by the flag State does not prejudge the authorisation of the caging operation as referred to in Article 24. 6. The master of the catching vessel that transfers bluefin tuna shall ensure that the transfer activities be monitored by video camera in the water. 7. The ICCAT regional observer on board the catching vessel, as referred to in the ICCAT Regional observer programme set out in Annex VII, shall record and report upon the transfer activities carried out, verify the position of the catching vessel when engaged in the transfer operation, observe and estimate catches transferred and verify entries made in the prior transfer notification as referred to in paragraph 2 and in the ICCAT transfer declaration as referred to in paragraph 3. The ICCAT regional observer shall countersign the prior transfer notification and the ICCAT transfer declaration. He shall verify that the ICCAT transfer declaration is properly completed and transmitted to the master of the tug vessel. 8. The tuna trap operator shall complete and send to the competent authorities of its Member State the ICCAT transfer declaration at the end of the transfer operation to the fishing vessel, in accordance with the format set out in Annex III. 1. By way of derogation from Article 11 of Regulation (EEC) No 2847/93, transhipment at sea of bluefin tuna in the eastern Atlantic and Mediterranean shall be prohibited. the tonnage and the geographic area of the catch of bluefin tuna to be transhipped. 3. Fishing vessels shall not be allowed to tranship unless they have obtained prior authorisation from their flag State. send a record of the transhipment to the flag State authority of the transhipping fishing vessel, within 48 hours after the transhipment has ended. 6. The masters of Community fishing vessels shall complete and transmit the ICCAT transhipment declaration to the competent authorities of the Member State whose flag the fishing vessels are flying. The declaration shall be transmitted no later than 48 hours after the date of transhipment in port in accordance with the format set out in Annex III. 1. The Member State under whose jurisdiction the fattening or farming farm for bluefin tuna is located shall submit within one week of the completion of the caging operation a caging report, validated by an observer, to the Member State or CPC whose flag vessels have fished the tuna and to the Commission. The Commission shall promptly forward that information to the ICCAT Secretariat. This report shall contain the information included in the caging declaration as set out in the ICCAT Recommendation 06-07 on bluefin tuna farming. 2. When the fattening or farming farms are located on the high seas, paragraph 1 shall apply, mutatis mutandis, to Member States where the natural or legal persons responsible for fattening or farming farms are established. 3. Before any caging operation, the flag Member State or the flag CPC of the catching vessel shall be informed by the competent authority of the fattening or farming farm Member State of the transfer into cage of quantities caught by catching vessels flying its flag. the catching vessel declared to have caught the fish is not authorised to fish for bluefin tuna. 4. The caging operation shall not begin without the prior authorisation of the catching vessel flag Member State or flag CPC. 5. The Member State under whose jurisdiction the farm for bluefin tuna is located shall take the necessary measures to prohibit placing in cages for farming or fattening bluefin tuna that are not accompanied by accurate, complete and validated documentation required by ICCAT. 6. The Member State under whose jurisdiction the farm is located shall ensure that caging activities shall be monitored by video camera in the water. This requirement shall not apply where the cages are directly fixed to the mooring system. 1. Commission Regulation (EC) No 2244/2003 of 18 December 2003 laying down detailed provisions regarding satellite-based Vessel Monitoring Systems (9) shall apply to fishing vessels as referred to in Article 2(b) of this Regulation. In addition, Member States shall ensure that all tug and towing vessels flying their flag, irrespective of their length, are equipped with and run an operational satellite tracking and monitoring device in accordance with Articles 3 to 16 of Regulation (EC) No 2244/2003. 2. Member States shall ensure that their Fisheries Monitoring Centres forward to the Commission and a body designated by it, in real time and using the format ‘https data feed’, the VMS messages received from the fishing vessels flying their flag. The Commission shall send electronically these messages to the ICCAT Secretariat. messages forwarded to the Commission are in accordance with the data exchange format set out in Annex VIII. 4. Member States shall take the necessary measures to ensure that all messages made available to their inspection vessels are treated in a confidential manner and are limited to inspection at sea operations. 1. Catches by trap shall be recorded after the end of every fishing operation in tuna traps and shall be transmitted by electronic means or other means within 48 hours of the end of every fishing operation to the competent authority of the Member State where the trap is located. 2. Each Member State shall, upon receipt, forward the catch record by electronic means to the Commission. The Commission shall promptly forward the information to the ICCAT Secretariat. 1. Member States shall take the necessary measures to ensure that all catching vessels referred to in the ICCAT record of vessels authorised to fish actively for bluefin tuna entering a designated port to land and/or tranship bluefin tuna caught in the eastern Atlantic and Mediterranean are submitted to a control in port. 2. Member States shall take the necessary measures to control each caging operation in the fattening or farming farms falling within their jurisdiction. 3. When the fattening or farming farms are located on the high seas, paragraph 2 shall apply, mutatis mutandis, to Member States where the natural or legal persons responsible for the fattening or farming farm are established. 1. Member States shall verify, including by using inspection reports, observer reports and VMS data, the submission of logbooks and relevant information recorded in the logbooks of their fishing vessels in the transfer/transhipment document and in the bluefin tuna catch documents. 2. The Member States shall carry out cross-checks on all landings, all transhipments or caging between the quantities by species recorded in the fishing vessels logbook or quantities by species recorded in the transhipment declaration and the quantities recorded in the landing declaration or caging declaration, and any other relevant document, such as an invoice and/or sales notes. 1. The ICCAT scheme of joint international inspection adopted by ICCAT at its Fourth Regular Meeting (Madrid, November 1975) as modified by ICCAT at its 16th Special Meeting and set out in Annex VI to this Regulation shall apply in the Community. 2. Member States whose fishing vessels are authorised to fish bluefin tuna in the eastern Atlantic and Mediterranean shall assign inspectors and carry out inspections at sea under the Scheme. 3. The Commission or a body designated by it may assign Community inspectors to the Scheme. 4. The Commission or a body designated by it shall coordinate the surveillance and inspection activities for the Community. It may draw up, in concert with the Member States concerned, joint inspection programmes for that purpose which will enable the Community to fulfil its obligation under the Scheme. The Member States whose fishing vessels are engaged in the fishery of bluefin tuna shall adopt the necessary measures to facilitate the implementation of those programmes particularly as regards the human and material resources required and the periods and geographical areas when those resources are to be deployed. 5. Member States shall inform the Commission by 1 April of each year of the names of the inspectors and the inspection vessels they are intending to assign to the Scheme during the following year. Using this information the Commission shall draw up, in collaboration with the Member States, a forward plan for Community participation in the Scheme each year, which it shall send to the ICCAT Secretariat and the Member States. 100 % during the harvesting process for tuna traps. all purse-seine vessels involved in joint fishing operations, irrespective of the length of the vessels. The national observer shall be present during the fishing operation. sight and record vessels which may be fishing contrary to ICCAT conservation measures. In addition, the observer shall carry out scientific work, such as collecting Task II data as defined by ICCAT, when required by ICCAT, based on the instructions from the Standing Committee on Research and Statistics of ICCAT. ensure, to the extent practicable, minimal disruption to the operations of vessels fishing in the Convention Area. 5. Pending the actual implementation by ICCAT of the Regional observer programme referred to in Article 31, each Member State within whose jurisdiction the fattening or farming farm for bluefin tuna is located shall ensure an observer presence during all caging operations and all harvesting of fish from the farm. all purse-seine vessels involved in joint fishing operations, irrespective of the length of the vessels. The ICCAT observer shall be present during the fishing operation. Purse-seine vessels referred to in (a) and (b) without an ICCAT regional observer shall not be authorised to fish or to operate in the bluefin tuna fishery. 2. Each Member State within whose jurisdiction the fattening or farming farm for bluefin tuna is located shall ensure an ICCAT observer presence during all caging operations and all harvesting of fish from the farm. The flag Member States shall ensure that masters, crew, farm and vessel owners do not obstruct, intimidate, interfere with, influence, bribe or attempt to bribe an ICCAT observer in the performance of his duties. 3. All costs arising from the operation of ICCAT observers shall be borne by the Member States. Member States shall charge those costs, to the farm operators and purse seiner’s owners. 4. The ICCAT Regional observer programme as set out in Annex VII shall apply in the Community. Each Member State shall ensure that the video records of its fishing vessels and of its farms, including video records of transfer and caging operations, are made available to the ICCAT inspectors and observers. Each Member State under whose jurisdiction the farm for bluefin tuna is located shall ensure that the video records of its fishing vessels and of its farms, including video records of transfer and caging operations, are made available to Community inspectors and observers. reduction or withdrawal of the fishing quota, if applicable. prohibition of caging or marketing quantities of bluefin tuna. 1. Community trade, landing, imports, exports, placing in cages for fattening or farming, re-exports and transhipments of eastern Atlantic and Mediterranean bluefin tuna that are not accompanied by accurate, complete and validated documentation required by this Regulation and by ICCAT Recommendation 08-12 on a bluefin tuna catch documentation programme shall be prohibited. 2. Community trade, imports, landings, placing in cages for fattening or farming, processing, exports, re-exports and the transhipment of eastern Atlantic and Mediterranean bluefin tuna caught by fishing vessels whose flag State does not have a quota, catch limit or allocation of fishing effort for eastern Atlantic and Mediterranean bluefin tuna, under the terms of ICCAT management and conservation measures, or when the flag State’s fishing opportunities are exhausted, or whose individual quotas are exhausted, shall be prohibited. Based on the information received by the ICCAT Secretariat, the Commission shall inform all the Member States that a quota of a CPC is exhausted. 3. Community trade, imports, landings, processing, exports from fattening or farming farms that do not comply with ICCAT Recommendation 06-07 on bluefin tuna farming shall be prohibited. The conversion factors adopted by the Standing Committee on Research and Statistics of ICCAT shall apply to calculate the equivalent round weight of the processed bluefin tuna. Member States shall define growth factors to be applied to bluefin tuna fattened or farmed in their cages and notify the Commission of the factors and methodology used by 15 September 2009. The Commission shall forward that information to the ICCAT Secretariat and to the ICCAT Standing Committee on Research and Statistics. Each Member State shall submit each year by 15 September to the Commission a detailed report on its implementation of the Regulation. The Commission shall submit each year by 15 October to the ICCAT Secretariat a detailed report on the implementation of the ICCAT Recommendation 08-05. The multiannual recovery plan for bluefin tuna in the eastern Atlantic and Mediterranean shall be deemed to be a recovery plan within the meaning of Article 5 of Regulation (EC) No 2371/2002. 1. Regulation (EC) No 1559/2007 is hereby repealed. 2. References to the repealed Regulation shall be construed as references to this Regulation and shall be read in accordance with the correlation table set out in Annex IX. 1. Articles 92 and 93 of Regulation (EC) No 43/2009 shall be deleted. 2. Article 4a(5) and (6) of Regulation (EC) No 1936/2001, as amended by Regulation (EC) No 869/2004 (10), shall be deleted. (1) Opinion of the European Parliament of 12 March 2009 (not yet published in the Official Journal). (2) OJ L 162, 18.6.1986, p. 33. (4) OJ L 340, 22.12.2007, p. 8. (6) OJ L 5, 9.1.2004, p. 25. (7) OJ L 263, 3.10.2001, p. 1. (8) OJ L 261, 20.10.1993, p. 1. (10) OJ L 162, 30.4.2004, p. 8. These additional specific conditions apply to baitboats and trolling boats in the eastern Atlantic, to vessels fishing for bluefin tuna in the Adriatic Sea for farming purposes and to the coastal artisanal fishery for fresh fish by baitboats, longliners and handliners in the Mediterranean. Each Member State shall ensure that catching vessels to which a special fishing authorisation has been issued are included in a list containing their name and Community fleet register number (CFR) as defined in Annex I to Commission Regulation (EC) No 26/2004. Member States shall issue the special fishing authorisation only when a vessel has been entered into the ICCAT record of catching vessels authorised to fish actively for bluefin tuna. By 15 January each year, each Member State shall send to the Commission the list referred to in point (a) and all subsequent amendments in a computer-readable form. The Commission shall promptly forward amendments to the ICCAT Secretariat. It shall be prohibited to land and/or tranship from catching vessels referred to in paragraph 1 any quantity of bluefin tuna fished at any place other than ports designated by Member States or by CPCs. For a port to be determined as designated port, the port Member State shall specify permitted landing times and places. The port Member State shall ensure full inspection coverage during all landing times and at all landing places. Member States shall transmit to the Commission no later than 15 February of each year a list of designated ports. The Commission shall send this information to the ICCAT Secretariat before 1 March of each year. Each Member State shall ensure that each landing is subject to an inspection in port. Each Member State shall implement a catch reporting regime that ensures effective monitoring of the utilisation of each catching vessel’s quota. The master of the catching vessel shall ensure that any quantity of bluefin tuna landed in designated port shall be weighed before first sale or before being transported elsewhere from the port of landing. the catch area and date. each tail tag shall have a unique identification number and be included on bluefin tuna statistical documents and written on the outside of any package containing tuna. logbooks must be kept on board to cover a period of one year of operation. the logbook is kept in equivalent live weight of fish and mentions the conversion factors used in the evaluation. transfer activity without transfer declaration. In the case of any boarding and inspection of a fishing vessel during which the authorised inspectors observe an activity or condition that would constitute a serious violation, as defined in paragraph 1, the authorities of the inspection vessels shall immediately notify the authorities of the fishing vessel, directly as well as through the ICCAT Secretariat. The flag State CPC shall ensure that, following the inspection referred to in paragraph 2 of this Annex, the fishing vessel concerned ceases all fishing activities. The flag State CPC shall require the fishing vessel to proceed immediately to a port designated by it, and where an investigation shall be initiated. If the vessel is not called to port; the CPC must provide due justification in a timely manner to the Executive Secretary, who shall make it available on request to other Contracting Parties. Inspection shall be carried out by inspectors of the fishery control services of Contracting Governments. The names of the inspectors appointed for that purpose by their respective governments shall be notified to the ICCAT Commission. Ships carrying inspectors shall fly a special flag or pennant approved by the ICCAT Commission to indicate that the inspector is carrying out international inspection duties. The names of the ships so used for the time being, which may be either special inspection vessels or fishing vessels, shall be notified to the ICCAT Commission, as soon as may be practical. Each inspector shall carry an identity document supplied by the authorities of the flag State in the form shown in paragraph 17 of this Annex and giving him an appointment stating that he has authority to act under arrangements approved by the ICCAT Commission. This identity document shall be valid for a minimum of five years. Subject to the arrangements agreed under paragraph 12 of this Annex, a vessel employed for the time being in fishing for tuna or tuna-like fishes in the Convention Area outside the waters within its national jurisdiction shall stop when given the appropriate signal in the International Code of Signals by a ship carrying an inspector unless it is actually carrying out fishing operations, in which case it shall stop immediately once it has finished such operations. The master (1) of the vessel shall permit the inspector, who may be accompanied by a witness, to board it. The master shall enable the inspector to make such examination of catch or gear and any relevant documents as the inspector deems necessary to verify the observance of the ICCAT Commission’s recommendations in force in relation to the flag State of the vessel concerned and the inspector may ask for any explanations that he deems necessary. On boarding the vessel an inspector shall produce the document described in point 6. Inspections shall be made so that the vessel incurs the minimum interference and inconvenience and the quality of the fish does not deteriorate. An inspector shall limit his enquiries to the ascertainment of the observance of the ICCAT Commission’s recommendations in force in relation to the flag State of the vessel concerned. In making his examination an inspector may ask the master for any assistance he may require. He shall draw up a report of his inspection in a form approved by the ICCAT Commission. He shall sign the report in the presence of the master of the vessel who shall be entitled to add or have added to the report any observations which he may think suitable and must sign such observations. Copies of the report shall be given to the master of the vessel and to the inspector’s government, which shall transmit copies to the appropriate authorities of the flag State of the vessel and to the ICCAT Commission. Where any infringement of the recommendations is discovered the inspector should, where possible, also inform the competent authorities of the flag State, as notified to the ICCAT Commission, and any inspection ship of the flag State known to be in the vicinity. Resistance to an inspector or failure to comply with his directions shall be treated by the flag State of the vessel in a manner similar to resistance to any inspector of that State or a failure to comply with his directions. The inspector shall carry out his duties under these arrangements in accordance with the rules set out in this recommendation but they shall remain under the operational control of their national authorities and shall be responsible to them. Contracting Governments shall consider and act on reports of foreign inspectors under those arrangements on a similar basis in accordance with their national legislation to the reports of national inspectors. The provisions of this paragraph shall not impose any obligation on a Contracting Government to give the report of a foreign inspector a higher evidential value than it would possess in the inspector’s own country. Contracting Governments shall collaborate in order to facilitate judicial or other proceedings arising from a report of an inspector under those arrangements. Contracting Governments shall inform the ICCAT Commission by 1 March each year of their provisional plans for participation in those arrangements in the following year and the Commission may make suggestions to Contracting Governments for the coordination of national operations in this field, including the number of inspectors and ships carrying inspectors. provided however, that implementation of the scheme shall be suspended between any two Contracting Governments if either of them has notified the ICCAT Commission to that effect, pending completion of an agreement. The fishing gear shall be inspected in accordance with the regulations in force for the subarea in which the inspection takes place. The inspector will state the nature of this violation in this report. Inspectors shall have the authority to inspect all fishing gear in use or that fishing gear on deck ready for use. The inspector shall affix an identification mark approved by the ICCAT Commission to any fishing gear inspected which appears to be in contravention of the ICCAT Commission’s recommendations in force in relation to the flag State of the vessel concerned and shall record this fact in his report. The inspector may photograph the gear in such a way as to reveal those features which in his opinion are not in conformity with the regulation in force, in which case the subjects photographed should be listed in the report and copies of the photographs should be attached to the copy of the report to the flag State. The inspector shall have authority, subject to any limitations imposed by the ICCAT Commission, to examine the characteristics of catches, to establish whether the ICCAT Commission’s recommendations are being complied with. He shall report his findings to the authorities of the flag State of the inspected vessel as soon as possible. (Biennial Report 1974-75, Part II). (1) The master refers to individual in charge of the vessel. exercise any other functions as defined by the Commission. Observers shall treat as confidential all information with respect to the fishing and transfer operations of the purse seiners and of the farms and accept this requirement in writing as a condition of appointment as an observer. Observers shall comply with requirements established in the laws and regulations of the flag or farm State which exercises jurisdiction over the vessel or farm to which the observer is assigned. Observers shall respect the hierarchy and general rules of behaviour which apply to all vessel and farm personnel, provided such rules do not interfere with the duties of the observer under this programme, and with the obligations of vessel and farm personnel set forth in Article 31. (1) At least one of the field codes RC, IR or XR is mandatory.